CPSIA - Comments & Observations: CPSIA - CPSC Punts on "Material Inaccuracy"
The war over the CPSIA Database continues at high pitch. 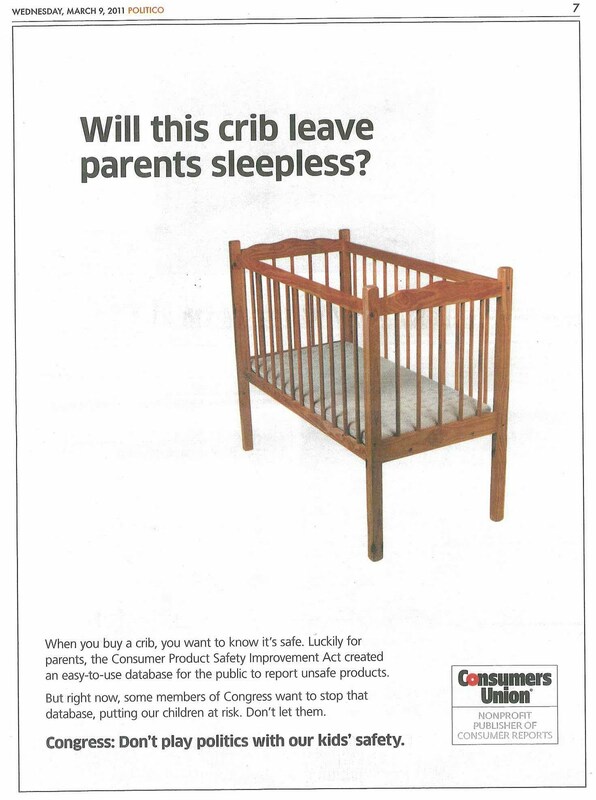 In today's print edition of Politico, Consumers Union upheld its well-deserved reputation as a fear monger with the below ad entitled "Will this crib leave parents sleepless?" CU intones: "When you buy a crib, you want to know it's safe. Luckily for parents, the [CPSIA] created an easy-to-use database for the public to report unsafe products. But right now, some members of Congress want to stop that database, putting your children at risk. Don't let them." The ad concludes with this warning "Congress: Don't play politics with our kids' safety." At the same time, the National Association of Manufacturers launched its own campaign documenting the many incidents of inaccurate data and other related snafus in the database SO FAR. The body of the NAM letter is found here. The objections to the CPSIA Database by manufacturers, importers, private labelers and retailers is all about inaccurate data. Filling the database with junky, incorrect or idle chatter masquerading as thoughtful analysis presents REAL threats to investments in companies, products and brands. Naturally, this also threatens jobs at many levels in our economy. Were the database maintained by the CPSC with clean and accurate data, I rather doubt the objections to this program would be so intense. However, industry stakeholders know that the media and our government are reactive by nature, tending to report, judge and act on stimuli before adequately investigating or resolving underlying accusations. Consider Toyota braking systems, DryMax diapers, Shrek glasses. It's a long list of manhandled companies or products. There are legitimate reasons to fear what a mismanaged "post it and forget it" database will do to industry. I realize industry objections may seem theoretical or somehow calculated to serve a larger purpose. It is worth noting, however, that the NAM letter provides concrete illustrations of the problem facing industry. Likewise, it is important to remember that consumer groups gloss over the objections of companies to pluck heart strings - that's how they raise funds. To clarify the picture, I have a REAL EXAMPLE to share. It involves the first (and so far only) submission to the database about our company's products. The following incident was filed against one of our products during the so-called "soft launch". The soft launch was intended to allow the CPSC to work the "kinks" out of the database and to practice interacting with the entire U.S. economy on consumer products. As you know from prior blogposts, Inez Tenenbaum has admitted in House testimony that the CPSC is not likely to be able to resolve questions of accuracy before posting the data (but they will try very hard). She said "That's what the rub is." Indeed. And you also know that once data appears on the Internet, its traces are all but impossible to remove. The long tail of misinformation is likely to affect brands and companies for years. The subject product happens to be discontinued. We have protested this particular filing to the CPSC and they replied with the following decision: "[CPSC] staff concluded that the report would be posted in the database but for soft launch". In other words, as a CPSC policy matter, what follows is a legitimate posting to the database when it goes live. Put yourself in the position of the CPSC and YOU MAKE THE CALL! First, consider the final rule on the database. The database is to be populated with "reports of harm". What's that? "Report of harm means any information submitted to the Commission through the manner described in § 1102.10(b), regarding any injury, illness, or death; or any risk of injury, illness, or death, as determined by the Commission, relating to the use of a consumer product." And what is a "harm"? "Harm means injury, illness, or death; or risk of injury, illness, or death, as determined by the Commission." Who can file? Basically anyone. No direct knowledge of the "incident" is required. The person making the filing does have to give their name to the manufacturer. In this case, we were faced with an unnamed accuser. Please note that Cheryl Falvey, General Counsel of the CPSC, said at ICPHSO this year that she couldn't imagine why anyone would withhold their identity in a complaint. This was our first "product incident". O for 1 so far, Cheri. I certainly hope the readers of this space are confident that, in fact, this item complies with U.S. law. In fact it does with test reports to prove it. Of course, small parts are always a concern whenever we design products for children under three years of age. Despite the IMPRESSION apparently given to the unknown filer BASED ON AN IMAGE SEEN ONLY ON A WEBSITE (not a physical examination of the product), the beads do NOT go through a choke tube. There are no small parts. Put another way, this accusation has no basis in fact and thus cannot be a "report of harm" under any reasonable interpretation. It is unadulterated and inaccurate conjecture. We sent the CPSC our third party test reports and photographs of the parts proving that they won't pass through a choke tube to support our protest that this complaint is "materially inaccurate". Nevertheless, the CPSC apparently determined the complaint states a "risk of harm" and thus should be published in the database. Our claim of material inaccuracy was denied - even though the issue was disposed by a valid third party test report directly on point . . . . Makes you wonder what WOULD be deemed "materially inaccurate". "However, in assessing whether a report of harm articulates a risk of harm, the staff is not adjudicating whether the product actually presents such a risk of harm. We have other processes for making that determination which require an assessment of the risk by Commission staff, including a subject matter expert - in this case, a physiologist on the issues relating to the likelihood of a choking hazard to children . . . . As I explained on Friday, the database process is set up to allow the manufacturer to state its reasons why the report does not present a risk of harm and have that appear next to the consumer's report. The staff handling claims of material inaccuracy will not be determining the ultimate question of whether the product does, in fact, present a risk of harm. That would only occur after a full assessment of the risk of harm by the subject matters experts and ample opportunity for the firm to address the issues with our compliance staff. The disclaimer is intended to notify users that the information has not been evaluated and specifically states: The Commission does not guarantee the accuracy, completeness or adequacy of the contents of the Consumer Product Safety Information Database, particularly with respect to the accuracy, completeness, or adequacy of information submitted by persons outside of the CPSC." Can anyone out there feel our outrage? Is this what Congress "intended"? Is it acceptable that the CPSC not exercise ANY judgment whatsoever on filings and that manufacturers be powerless to stop the posting of nonsense? Can't we expect more of this agency with its 500 employees? The CPSC informs us that all is well BECAUSE even though the accusation is known to be false, we are allowed to post comments side-by-side with the accusation. ". . . it would be up to the Firm to decide whether it wants its test reports and photos posted as comments in response to the report. The conclusion was that this is the type of report that has been included in our databases in the past and would be included in the public database along with the manufacturer's comments and the mandatory disclaimer as to the accuracy of the information in the public database." So, there you have it. The CPSC knows it is posting nonsense and other pap, refuses to filter out the bunk and then boldly asserts that it is up to the manufacturer to choose how it wants to counter the misinformation. The term "materially inaccurate" does not apparently extend to factually inaccurate accusations - I believe it only refers to misidentified products. [This is not the first tortured interpretation of the English language to emerge from the CPSC during this administration.] One wonders to what lengths the CPSC will go to post controversial complaints in the database. They have their justification - they must make consumers "safe" with errant complaint data. It is a rich irony that the CPSC doesn't even argue the complaints are true or accurate and then scurries to hide behind its website disclaimer when asked to defend its lame administrative approach. No doubt twisting themselves into a linguistic pretzel is only the start for this CPSC. 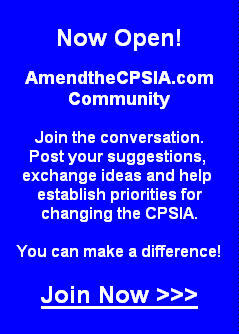 This position is NOT mandated by the CPSIA - this is a political decision dictated by forces outside the law. Please note that in this case, the CPSC overlooked a valid third party test report mandated by the CPSIA that refutes a conjecture based on a photo posted on a website. Guess that test report doesn't count for much at the CPSC. But it is ESSENTIAL to keep kids safe. . . . Right. And so is the rest of the CPSIA and this database. Right. The CPSC didn't just "punt" on the meaning of "materially inaccurate" - they punted on the future of your business and the jobs you provide to your teammates. If only we could punt on the jobs of the people who were doing this to us. . . . This issue is beyond frustrating! I had the same experience during soft launch (maybe the same "concerned citizen"?) who saw my product on the shelf at a retailer (didn't buy it, didn't use it) and surmised that my product creates a "potential for death or injury [that] is incredibly high" based on a false assumption about my product and a bad experience her child had with a totally different product. The hazard was identified as small parts, even though the product was marked for ages 3 and up and had the small parts warning on the package. There has to be some kind of protection against this kind of totally unfounded speculative nonsense being part of an "injury" database! This data-base is going to get slammed eventually with the data-base equivalent of trolls. Wait and see. I'm predicting that unless safe-guards are put in place, it will be a utter laughing stock in 3-5 years--or less. My guess is that it will become so bogged down and worthless as to be SHUT down--but only after the damage is done. A terrible thing just happened. I opened some bottled water and it was contaminated with Dihydrogen Monoxide. I think I should report this in the database. What do you think? @Anonymous: Not only that, but severe DHMO contamination has been found in groundwater near places where "hydraulic fracturing", or "fracking", has been performed! I'm sorry, which side of the looking glass are we on? I seem to be losing track. No point wasting time actually reviewing claims as they are legitimate by virtue of the fact that they have been made. Illegitimate claims (ie. those that have never been made) will be removed immediately - in fact they already have been! And your test results - what do they have to do with anything anyway?